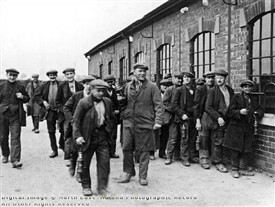 "NEW COLLIERY– The work of preparing for the opening of the new pit proceeds apace. Ten officials’ houses have already been erected and eight are nearing completion. On the Boughton to Wellow road several of the bungalows are occupied by the men engaged in preliminary work of sinking. Sinking has been commenced and is in the capable hands of the Francois Cementation Co., who have a patent process of freezing the water as they proceed with digging operations. Twenty-five feet are to be dug out in the first efforts and the supports of concrete and cement concreting are put in; this will occupy a considerable period of time. After the first process is complete a further boring takes place for 50 or 60 feet, using liquid cement for the purpose of supports. All this is preliminary to the erection of pillars on the top of the shaft, erection of head gears, and engine houses, so that before the actual work of drawing coal can commence a period of say two years or more must elapse. Further building operations are to take place in the near future". This page was added by Alexander Combie on 12/04/2012. I have the original plans / drawings of ollerton colliery - some of them are beautifully drawn on some kind of cloth.